At the heart of Alexandria on the Potomac River waterfront, Old Town is one of the most sought after North Virginia addresses. Old Town uniquely balances its rich history with the comforts and modern conveniences of an urban city. The well-preserved historic district is best known for its charming townhouses lining quaint cobblestone streets but also offers more traditional single-family homes as well as contemporary condos on the waterfront. Read more about Old Town. Once home to George Washington and Robert E. Lee, the cobblestone streets now hum with tourists and shoppers flocking to the Old Town Boutique District, named by the Wall Street Journal as featuring "some of the best galleries in the DC region." Old Town is also a foodie's dream with all sorts of fine dining options ranging from trendy bistro to historic tavern to accommodate any palate or occasion. The area is divided into four quadrants -- NE, NW, SE, and SW -- comprising neighborhoods such as Potowmack Crossing, Old Town Greens, and St. Asaph Square. With its borders along the River, Old Town offers a number of parks and trails that offer scenic views as a backdrop to a heart-pumping run or bike ride. Located just across the Potomac from the District and minutes from the airport, Old Town is convenient for commuters and served by the King Street Metro on the Blue/Yellow Line. 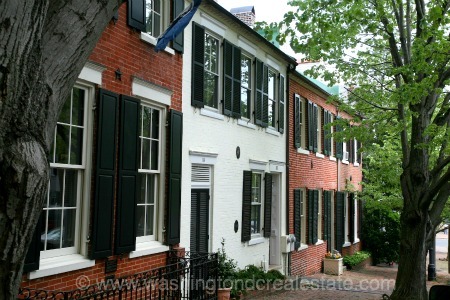 Old Town is bordered by Slater's Lane to the north, the Beltway to the south and the Potomac River on the west.